baby shower Luncheon plus Kristin Hassan coupon code! This past weekend I went to my cousin's baby shower. The lunch was beautiful and everyone had a wonderful time! It was in the 50's and sunny on this day, so this outfit was perfect for the occasion! Now lets take a moment and talk about my new Kristin Hassan bangle. I just love it! It is a great twist (no pun intended) on the regular bangle and goes with just about anything and everything! 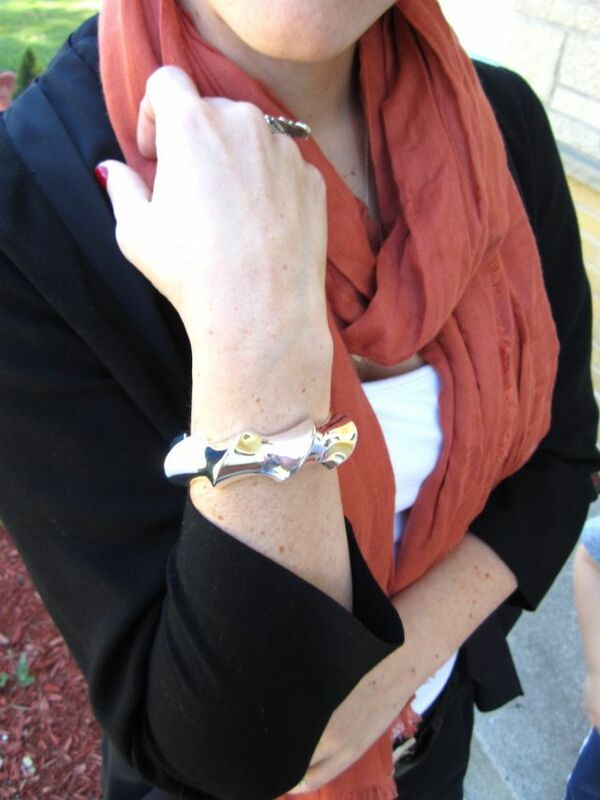 Kristin is giving us another great coupon code to get ANY PIECE OF JEWELRY on her site for $10 OFF! Offer good through Sunday at 10pm. Simply use the code SADBBLOG10 at check out and shipping is alway free! I'm totally crazy about the color of that scarf! Love the colors on this one and the model :) Its great coupon codes here Thanks so much for these codes. These codes help me a lot in improving my credit score. Great Work!! !